No kidding. It has to be one of my most favorite foods. I just love how versatile it is and how everyone – EVERYONE – has their own idea of what ‘chili’ should be. Some like beans, others don’t. Some like big hunks of meat and others like theirs heavy on the veg. Some like it hot, some like it mild. And you’ve even got the red versus white thing going on here, too. There are about as many different chili recipes in the world as their are hairs you on your head. Maybe even more, depending on your genetics. I fall into pretty much all of those camps when it comes to chili. The only chili I DON’T like is chili in a can. Not a fan of that chili in a can. I thought that’d get your attention. All teasing aside, you need only 10 minutes of prepping and chopping to get this chili going in your slow cooker – and then it’s another 7-8 hours of hands-off cooking. Of course, you can also make it on the stovetop if you don’t have a slow cooker or just like the act of cooking (which, admittedly, sometimes I really like to stand over the stove and stir up beautiful pots of soup and such) – so I’ve also included directions for making this on the stove as well. When the chicken is cooked through you can either remove it to a plate and shred it with two forks or carefully shred it right in the slow cooker before you add the coconut milk. Then all you have left to do is stir in a little fresh lime juice and chopped cilantro then serve it up in big bowls and dig in. Your perfectly warm and satisfying bowl of Whole30-compliant Slow Cooker White Chicken Chili is waiting! Our hearty, bean-free Slow Cooker White Chicken Chili takes just 10 minutes to prep! Great for busy weeknights & freezer meal cooking sessions. Add onion, peppers, garlic, and spices (cumin through black pepper) to the bottom of a slow cooker. Arrange chicken on top of vegetables in a single layer. Add broth and place lid on slow cooker. Set heat to LOW and cook 7-8 hours or until chicken is done and vegetables are tender. Remove chicken from slow cooker and shred with two forks. Return chicken to slow cooker. Turn heat to HIGH. Add coconut milk, stir and replace lid. Continue heating an additional 10-15 minutes or until soup is heated through. Stir in lime juice and cilantro. Taste and adjust seasonings as desired. Serve in bowls garnished with chopped cilantro and lime wedges, if desired. Place a large saucepan with lid (or Dutch oven) over medium heat. Add 1 Tbsp. ghee or coconut oil and allow to melt. When ghee just starts to shimmer, add onions and peppers. Saute 5-6 minutes, stirring occasionally, until onion and peppers start to soften. Add garlic, cumin, oregano, chili powder, salt, and pepper. Continue to cook an additional 30-60 seconds or until fragrant. Lay chicken in the pan over the onion and pepper mixture. Add 1 cup broth and bring just to a boil. Reduce heat, cover and simmer for 10-12 minutes or until chicken is cooked through. Shred chicken in the pan using two forks. Add remaining 1 cups of broth and coconut milk and return to a simmer. Cover pan and allow chili to simmer for an additional 10 minutes. Remove from heat and stir in lime juice and cilantro. Taste and adjust seasonings as desired. Serve in bowls garnished with chopped parsley and lime wedges, if desired. Add oil. When the oil is melted, add onion, bell pepper, and jalapeno. Saute 5-6 minutes, stirring occasionally, until onion and peppers start to soften. Add garlic and spices and cook an additional 30 seconds or until fragrant. Press ‘Cancel’. Add chicken breasts and 2 cups of broth. Lock lid into place. Turn the vent valve to ‘Sealing’ position. Select ‘Manual’ setting and set cook time to 20 minutes. Add coconut milk, lime juice, and fresh cilantro. Stir to combine. Taste and season with additional salt and pepper as desired. Note: We only test the recipes with the listed ingredients and measurements, unless otherwise noted. If you would like to try a substitution, we would love to have you share what you used and how it turned out in the comments below. Thanks! How do you like your chili? Spill the beans in the comments below and tell us about your favorite chili! So we are “snowed in” today and this looks perfect HOWEVER, I don’t have a can of full fat coconut milk in my pantry. Is there an alternative? Is this ingredient a deal breaker on the flavor / consistency? thanks in advance! Sorry for the late reply – I was enjoying some fresh air and shoveling out the chicken coop after yesterday’s big storm here in Colorado. The full-fat coconut milk isn’t a deal breaker – it just adds creaminess and makes it ‘white’. It also adds fat to make what would be a relatively low-fat chili more satisfying. You can sub almond or cashew milk if you’re keeping it Whole30 and still want a creamier texture (or add milk/cream if you’re not Whole30-ing). If you leave out the milk entirely, I’d suggest adding some diced avocado to the top when you serve it for some fat to keep you satisfied longer. Thanks Jessica for the thorough / helpful response! I am making this tomorrow night (finally no snow & made it to Trader Joe’s for full fat coconut milk) so I will let you know how it turns out! Thanks for this information. I’m allergic to coconut so I’m glad to see the substitution. I’m also healing my gut so I can’t use any of the peppers or chili powder. Any suggestions on substitutions? I’m not sure you could substitute anything for the peppers or chili powder and retain any sort of ‘chili’ flavor. Cumin, as it’s a seed, is also contraindicated on an auto-immune paleo protocol. So basically, what we’re looking at is creating an entirely different flavor profile. I would suggest replacing the bell pepper with more onion or even carrots. If you leave out the peppers, cumin and chili powder then I’d suggest taking a more traditional ‘chicken soup’ twist on things by using dried thyme, sage, rosemary, etc. You’ll still have an easy dish to prepare that’s hearty and nourishing, but it won’t be chili. Hey Jessica! I could only figure out how to reply lol just a quick question. I am making this in the instant pot later. I don’t have a can of coconut milk but I have the refrigerated box kind. Will that work the same or should I skip it? I was thinking of adding sweet potato and maybe cauliflower also topping with avocado so wouldn’t be a huge deal if I couldn’t add the milk. Hi Jessica! I’m clearly late to the party (by like a year) but better late than never 🙂 if i’m subbing regular milk or cream for the coconut milk which i couldn’t find anywhere in our market (grumble) how much should i use? Would it still be 14 oz? Thanks in advance! Better late than never, right?! If you’re using heavy cream in place of the coconut milk I would start with 4-6 ounces then add more if you feel it needs to be creamier. Thanks for sharing! I made this tonight for dinner, it turned out amazing! I added a can of Rotel to my batch for a little extra spice and flavor – definitely my favorite whole30 recipe now! 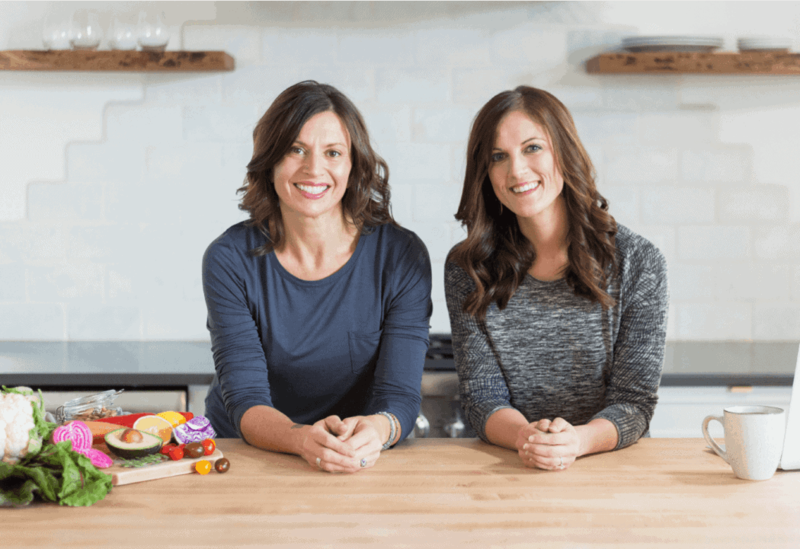 This is so great to hear – “favorite Whole30 recipe”..that’s quite the compliment! 🙂 Thank you for sharing your feedback…we appreciate it! Please excuse my ignorance, but what is “Whole30”? 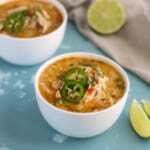 I just discovered this website & the recipe for slow cooker white chicken chili. I’m planning to make it this weekend and will also add a can of Rotel tomatoes, as suggested by Maria on 01/09/17. Sounds yummy! Enjoy! We hope you enjoy this recipe! Hi!! Is rotel whole30 compliant? Have you tried in a pressure cooker? I am wondering if I could saute veggies in the instant pot then add chicken and let the pressure cooker do the work! Thanks! Yes, I have and you’re right on about sauteing the veggies first then adding the chicken and remaining ingredients (except coconut oil and cilantro) – I cook mine at high pressure for 17 minutes with natural release. Hi Jessica! I have a Q RE: instant pot happenings – you said except coconut oil and cilantro above. Did you mean the coconut milk? And if so, when did you add in the coconut milk? After cooking at high pressure for 17 minutes with natural release? Do I turn on a heat setting at that point? Sorry, I’m SUPER new to the IP (bought one because of you guys!) and I am trying not to botch this recipe in it :o) Thanks in advance!! Sorry, that should have been “except coconut milk and cilantro”. You’ll add both of those at the end after you’ve released the pressure naturally (then flipped the vent valve to release anything still left in there). Once you’ve removed the lid and stirred in the coconut milk you can turn the pot to ‘Saute’ to warm it up a bit. Add the cilantro just before serving. Hope that helps – enjoy your chili! Awesome, thank you soooooooo much!! Really appreciate it! At what point do we add the oil? Its not in the steps. If you’re making the stovetop version you’ll add it before you saute the onions. The slow cooker version doesn’t require oil since you’re just tossing everything into the slow cooker. 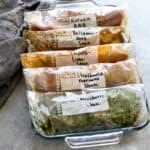 What about for the Instant Pot method? It says add oil as first step – is it the same amount as you would for the stovetop version? No, it wasn’t. 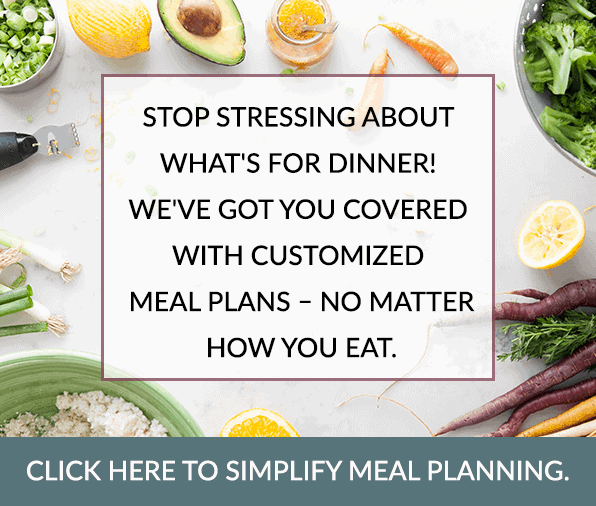 The slow cooker option has you tossing everything right into the slow cooker versus sauteing the vegetables in the stovetop option – so you don’t need to add the oil to the slow cooker. However, you certainly can do so to add more flavor and some fat. I made this yesterday in the slow cooker, and it was fantastic! Creamy, satisfying and delicious. I tossed some avocado on top, which was great, but not necessary. This will definitely be a favorite go-to recipe for me–easy, delicious and great to pack for work lunches. Thank you for sharing! Thanks for your kind words — we’re so happy to hear you loved it. It makes such a great lunch – so warm and satisfying. Enjoy! Made this tonight and I’m disappointed. Not sure where the red color in your picture comes from. Mine is white and very bland. Glad I didn’t make a double batch for leftovers. I’m sorry to hear that you found the chili disappointing. The red color in the photos (and all of the other batches I’ve prepared since) comes from the chili powder. Your tastes may be different than others and/or your chili powder may be old and lacking flavor – in either case, tasting and adding more spice to your taste is always recommended. Hopefully you’ll try again with your own tweaks to meet your tastes. Can I cook this on high for 3 hours instead of low for 6? Thanks! You sure can – though the exact cooking time will ultimately depend on your slow cooker (some run hotter than others). What about adding in quinoa? You certainly can add cooked quinoa before serving, if you’d like. I wouldn’t add it uncooked with the other ingredients though as it would likely become overcooked and possibly lend a bitter flavor to the chili. I made this a few weeks ago and it tasted amazing! Broth was a bit watery, though. Any suggestions? I was thinking of putting the coconut milk in the whole cooking time. Would that work? If you used broth from a box (rather than homemade broth) it may feel more ‘watery’. Also, depending on how tightly your slow cooker lid fits, you may have had less evaporative liquid loss so your broth was thinner. I’d suggest cutting back the broth by 1 cup next time as you can always add more later if you need it. I don’t usually add the coconut milk at the beginning because it can sometimes separate and feel gritty, IMHO. At what point in the cooking process would you freeze this chili? I cook the recipe all the way through (including adding the coconut milk). Then I allow it to cool slightly before transferring it to freezer-safe containers which I then put in the fridge until completely cooled then I move them to the freezer. Thoroughly chilling foods before freezing them decreases ice crystal formation on the surface of the food thereby decreasing the risk of freezer burn. To serve, I place the container in the fridge for up to 48 hours to thaw then I reheat it on the stove. Hope that helps! Planning to make this for dinner. Quick question. Do you chop or crush the garlic or throw the cloves in whole? Thanks! You’ll want to mince or finely chop the garlic before adding it. Sorry about that – just updated the recipe to clarify. Thanks for the catch! So good!! We had this last night and my husband and son loooved it! I did change a few things…used only 1/2 onion, about 2.5 lb of chicken breasts, only 2 cups of broth, and all the juice from the lime. I served it over GF pasta in a bowl. Delicious! I am definitely a subscriber now! Though a bit soupy than what I’m used to, this was the best chili I ever had! Will use less broth next time. Husband liked it, too and wanted a second bowl. Will definitely make this recipe again! If adventurous, have a serving with Avocado, like we did. That’s great to hear! Hubby-approved is always good news. With slow cookers I find that sometimes I need to adjust the liquid based on how long the chili cooks, how hot my slow cooker runs (mine runs pretty hot) and whether or not the lid is tight fitting (mine is not – it’s been dropped one to many times in the last 24 years) – so I suspect your lid fits tighter and thus doesn’t allow for as much evaporation. This is delicious. I made in the Instant Pot and when I added the lime and coconut milk, the coconut milk got kind of curdly…still tastes great, but does not look like it should. Any idea why? Should I have added the milk first? I’m not sure why some brands of coconut milk curdle with the addition of the lime juice and others don’t. Next time I’d suggest adding the coconut milk first then waiting to add the lime juice just before serving (after it’s cooled down just a bit) Bonus: You get more of that bright citrus flavor this way as well. i had chicken already shredded in the freezer, how would you suggest working that? I would make this recipe using the stove top directions as directed but omitting the chicken (essentially you’ll be making a vegetable and broth soup) then add the cooked, shredded chicken to the soup once the vegetables are tender. Followed by the lime juice, coconut milk, cilantro, etc. I have made this soup several times since I found this recipe. It’s easy to throw together in the crockpot and so so delicious! So great to hear you love this recipe! This is THE best tasting meal, ever. We aren’t following whole 30, we do eat dairy, but just trying to be healthy. Other than adding extra salt and one less cup of broth, I followed the directions exactly. The coconut milk and like are a must in my opinion! I will be making this a few times a month. This is so great to hear! Thanks for the feedback. Hi! So excited to find this recipe! Do you know if I could add crushed tomatoes to it? Would that taste odd with the coconut milk? Thank you!! This recipe was SO DELICIOUS! Healthy and full of flavor! And so easy to make! Thanks for the recipe! Thanks, Megan! Glad you loved it – it’s one of my favorites, too! Making this for dinner tomorrow! Do you think I can add sweet potatoes? If so, would you cook them the whole 7-8 hours with the chicken or add them later? I know this is an old comment, but did you end up adding the sweet potatoes? If so, how was it? I have this soup in the crock pot now for dinner tonight. I can’t wait to taste it! Sweet potatoes sound really good, though! You can certainly add sweet potatoes to this recipe! That does sound really good…I may have to try it, too! Hi! Do you use everything in the coconut milk can, or only the solid portion? You’ll want to blend the solid with the liquid then use that. So delicious!! A perfect blend of flavors! Will definitely make again ???? So great hear! We love this recipe, too! Any suggestions for adding more vegetables? Was thinking of adding in some chopped frozen spinach. I have found that many Whole30 recipes, despite the plan calling for lots of veggies, don’t have enough for me. If you were to add veggies (not potatoes) which would you choose and when would you add? Put this in the slow cooker this morning and had it for dinner. My only complaint is that it needs more veggies and maybe a bit more body. Its kind of thin and soupy, not the thick stew i often associate with chili. I am going to add carrots and maybe zucchini next time to make it hartier. I did put cubed avocado as a garnish along with raw onion and jalapeno (i hate cilantro, so i left it out). The lime is absolutely necessary. I didnt dislike the coconut flavor, but the lime cancelled it out and i could bareky taste it after the addition of lime juice. Yes, you’re right about being more on the soupy side than the thick chili side. I’ve experimented with adding a thickener like coconut flour or arrowroot starch but didn’t feel it was the best texture. Adding more veggies is always a good way to go, too. I thought this was a really great recipe, but I did add some tweaks of my own. I doubled the spices and lime juice, replaced the jalapeno with a poblano, added a thai chili and topped with avocado. Mine wasn’t watery at all and really held up after reheating for lunch! Yummmmm! Glad to hear this recipe turned out for you. Those sound like awesome and delicious tweaks! Unfortunately, I can’t recall the exact size of each portion. Our servings were pretty big as they were intended to be the bulk of the meal (served with a small salad or other vegetable). 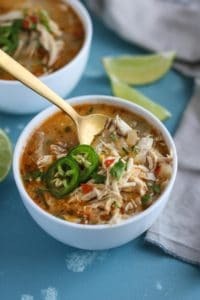 I am hoping to make this today or tomorrow and would love some advice on what to look for when buying coconut milk for cooking. I am new to the Whole30 and using coconut milk in my cooking. I bought the So Deliciois brand of coconut milk but the more research I’ve done makes me think that this is used more as a beverage than I’m cooking. What brands do you suggest? Do you recommend canned vs. boxed? There are so many different kinds and brands out there it’s hard to know what to use! For cooking I always recommend the full-fat canned coconut milk since this is what most recipe creators will use in a recipe (unless otherwise specified). I personally but the Whole Foods Everyday 365 organic coconut milk because it’s affordable and comes in a BPA-free can. Native Forest and That Kitchen are also good brands (though I’m not sure Thai Kitchen has a BPA-free can or not) For drinking or using in smoothies or hot cocoa, I use the So Delicious unsweetened variety in the box. I hope that helps! Yikes! I accidentally put in the cocoanut milk in at the same time as everything else and I am cooking on high to be ready by dinner. Will it still be good or have I ruined it? It will be fine. It may separate a bit but it will still be safe (and delicious) to eat! I can’t wait to make this! My plan is to make it the day before then bring it to work in the crock pot and let it sit on the “warm” setting for people to enjoy all day. Would it still be okay to add the coconut milk at the end when I cook it? What a great idea to bring this to work. It should be fine on ‘warm’ after you’ve added the coconut milk. Enjoy! This was yummy but next time I will definitely cut back on the broth by a cup. Will probably add another pepper of a different color for more veg and color. I served over some baby spinach for more stuff and my husband added white beans to his. Avocado on top is delish! Very good and will make again! Glad you loved it, Sheri! Those all sound like great substitutions. You could use a whole chicken or even cut up fryer parts with the skin removed. That way you could just remove the chicken and slip the meat from the bones without having to wrangle the whole bird out of the slow cooker while it’s literally falling apart. I made this today and decided to chop up cauliflower and add it when I put in the coconut milk. I then cooked it on low for about 2 more hours. I also added a tad bit more broth and Himalayan salt. The additions were an excellent choice. The cauliflower was an excellent substitute for beans. I love the idea of adding chopped cauliflower – I’ll be doing that next time, too! Looks like a perfect Fall / Winter recipe. Can’t wait to try it. But so I’m clear – it’s called “chili” because of the spice, right? We’re not to add beans to this? Thank you! It’s really delicious. Yes, the name ‘chili’ refers to the spice in this recipe. However, not all chilis contain beans depending on local and cultural food customs. The written portion before the recipe states 5-6 hours, but in the recipe itself it says 7-8 hours. I know certain slow cookers run hotter than others but in your experience is it closer to 5-6 hours for the chicken to cook through or 7-8? Trying to time it correctly for dinner time! It should read 7-8 hours. I forgot to update the text when I updated the recipe after retesting it with a new slow cooker. Though you are right, all slow cookers will differ so if yours in done in 5-6 hours (meaning the chicken is cooked through) then I’d suggest turning off the heat then to avoid overcooking the chicken. Thank you for this recipe! It was absolutely delicious! I didn’t allow myself enough time to cook it on Low heat so I did 3 hours on high. My chicken and veggies were thoroughly cooked! Such an easy, simple, and tasty recipe. Our two-year-old loved the meal too! Great to hear you enjoyed this recipe! Flavor was amazing! I would add only 3 cups of broth as this is definitely more like soup. I am following a FODMAP diet so I eliminated the onion but added garbanzo beans and rice upon serving. Will definitely make again! Awesome! Thanks for sharing your feedback and good to hear you were able to make substitutions to make it FODMAP friendly. Absolutely wonderful, Thank You for sharing! I made this over the weekend, and it was delicious! 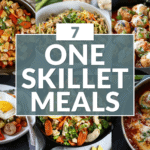 I wanted leftovers for the week so I doubled everything except the onion and bell pepper, I just used one large of each… I did use 2 jalapenos and we didn’t find it spicy at all, they just add a great flavor. I also only used 1 tsp of salt and 6 cups of broth. Remember, this was a double recipe. I cooked the chicken on high for about 5 hours (I put it in frozen) and then tore it up and added everything else. All I could find was Goya full fat coconut milk and it worked just fine. I didn’t add the cilantro to the whole pot, just to my bowl, and I separated out half the leftovers and added cannelini beans to hubby’s. He took it to work. Definitely will make again! Thanks for the great recipe! Great to hear you enjoyed this recipe! Thanks for sharing your feedback and the changes you made. Always helpful! I just made this, and it is super delicious! I feel certain that people who said it was bland did something wrong, because it is quite flavorful. I did double the lime because I love lime. The consistency is more like a soup than a chili, so if you want it to be thicker, isuggest not putting in the full 4 c of broth. Make sure you use the full fat coconut milk from the can, not the stuff in a carton, not a cab that says lite. I ate some on its own, topped with avocado, and some with white beans (from a can) mixed in. I loved it both ways. Thanks for a new favorite! I just threw this in the crock pot and accidently put the coconut milk in with everything else right at the beginning! I am planning to cook on low for 7-8 hours. Will it be ok? Chances are good it will be just fine. The coconut milk may separate a bit (and it may not) but it will still be safe to eat- and delicious! I wonder if my coconut milk was “off”. I can’t describe the taste at all but everything smelled and tasted good up to that addition (I used my Instant Pot to make this)…. I did turn the IP to saute again so that it would heat through once I added the lime juice, coconut milk and cilantro. Any thoughts? Thanks! I’m sorry to hear that your chili tasted ‘off’ – it very well may have been the coconut milk since you said it was fine before you added it. Preparing it in the IP versus stovetop or slow cooker shouldn’t affect the flavor at all. Perhaps try again – this time tasting the coconut milk before adding it. 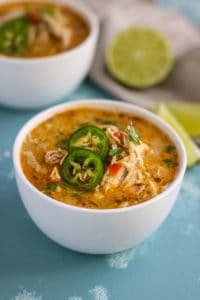 I doubled this recipe in the instant pot today minus the jalapenos (so the toddlers will eat it) and it came out delish! I would make again. Great to hear you enjoyed this recipe and that it’s toddler approved with modifications! I made this tonight-it’s excellent! Will definitely make again! Fantastic! So glad you loved it. Made this for my husband and I for our Day 2 Whole30 dinner and it was delicious and super easy! Will definitely make this again. We both loved it. Was nervous it would have a coconutty flavor, but it didn’t at all! Glad you loved it! You’re right about the coconut – you can’t taste it thanks to the chili powder. hello! This looks like a great recipe 🙂 I am trying to figure out where the carbs and sugars in the nutritional info are coming from though? I am following THM and trying to keep out as many carbs as possible. The carbs and sugars in this recipe, 6g and 3g, respectively are coming from the tomatoes, onions and bell pepper. Hope that helps! thanks for your response…I have read over the recipe a few times and I don’t see the tomatoes! Lol!! Am I totally missing it?! haha…it’s all good! Thanks so much! Can’t wait to try it. This was sooooo good! It’s a whole 30 staple! Awesome! So great to hear you loved it! I currently have this in my crockpot and I can’t wait to eat it for dinner! I accidentally put in the full amount of broth instead of only putting 2 cups at first….hope it will be okay! Thank you for this recipe. Adding extra broth won’t be a deal breaker – it will be thinner, like soup, but still taste great. Is the serving size really 1/5c? The serving size is 1/5th of the recipe which comes out to be about 1 ½ – 2 cups per serving if my memory serves me. I just got an instant pot and want to use it for this. Can I use frozen chicken? Does it change the directions at all? Yes, you can use frozen chicken. 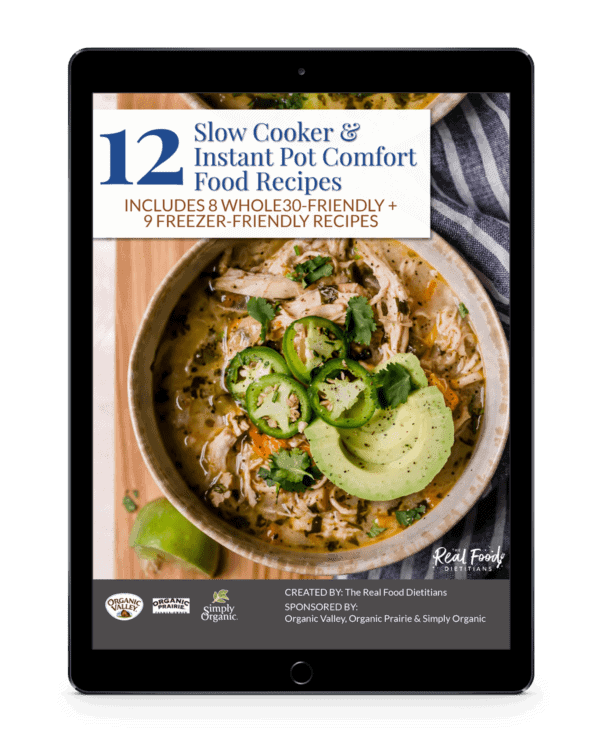 You do not need to adjust the cooking time – the Instant Pot will automatically adjust (meaning it will take a few more minutes to come to pressure – during which time it will be essentially flash thawing the chicken inside). I’m planning on making this over the weekend (so excited!) and was wondering when it is you add the jalapeño? Is that just something you put on top at the end or do you cook it with everything else? I’ll be using my crock pot for this recipe. This is such a good recipe! Excited to hear how you like it. You can do either or. Add it with the rest of the ingredients or if some don’t like it as spicy you could add it as a topping. I made this for dinner tonight, and it was delicious!! This recipe will definitely become a staple in our home! This is so great to hear, Jenn! Glad you loved it. Does the coconut milk make it taste sweet? We don’t think so. The onion, garlic and chili covers it well. If you’re not doing a Whole30 you can use cream in place of the coconut milk or if you are Whole30 you can also use unflavored/unsweetened Nutpods or a similar compliant non-dairy milk or creamer in it’s place. Made this tonight and was so good! Added a little cayenne pepper since we like spicy. My husband even loved it and he is a very picky eater! Thank you so much for this wonderful, easy recipe! Will definitely make again! I’m making this in my instant pot since I really don’t have many for it and I’m still learning how to “wing it” in the IP. I didn’t select manual, but I still need to choose high or low pressure. 20 min on high with slow release seems long for chicken breasts. Maybe better suited for thighs? I’m looking forward to this chili! Both of my kids love coconut milk I’m recipes (my daughter is allergic to almond milk) so finding a recipe that uses it is always a plus. Thanks! I found this very bland, even with increasing the spices. I used a carton of the Pacific Free Range Chicken Broth and Penzey’s spices. Thank you for the great recipe! I served this over cauliflower rice and it was wonderful! 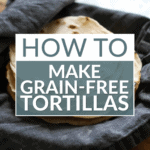 Will definitely be making again — and you can’t beat how easy it is. ???? As I was making this I thought, I don’t think the teenagers will like it but at least I’ll have something for lunches. I was wrong – all my kids liked it! Thanks for another great recipe. My daughter suggested adding sweet potatoes next time. I love this! Sweet potatoes are a great addition. Especially the white ones if you can find them. They slightly starchier and hold up a little better than the orange ones. This looks delicious, only question I have is I see sugar in it, what ingredients has the sugar? Thank you! The ‘sugar’ listed in the nutrition information are those naturally occurring in onions and peppers. Love your slow cooker recipes and IG feed, but this recipe was not my favourite… Sorry! It was fast, easy and warm. My H and I just felt like something was missing. Maybe we will try avocado on the leftovers tomorrow. I’m very picky with soups and I rarely like them. This soup was AMAZING and was filling at the same time. Thanks for the recipe and an instant pot version! the instant post recipe turned out very watery, any ideas why? When adapting a slow cooker recipe for the Instant Pot you need to decrease the amount of liquid (sometime up to half) to account for the fact that you don’t have the same amount of evaporative loss as you do with a slow cooker that’s perking away for several hours. When converting a soup/stew/chili for the Instant Pot at home, I always start with less liquid then add more in after the cooking as completed if I feel like it needs it. Using canned tomatoes without added salt and omitting the additional salt called for in the recipe will help you lower to total sodium content of this dish. Wonderful! Loved this soup! I did this in the instant pot, and it turned out great! I would recommend that you specify how much chicken is (1 1/2 pounds) I had to google how many pieces of chicken that is… I’m so dumb lol. I would also recommend you specify to dice up the bell pepper… I had to look at the picture to see if it was diced or sliced. Anyways, great meal! I served mine with Tortilla Chips. You’re definitely not dumb! How many pieces of chicken make up 1 ½ lb. is dependent on the type of chicken (breast vs. thigh) and how BIG each piece is. A kitchen scale is definitely a worthwhile investment for things like this. This soup is simply delicious!! Hi! I am a college student so slow cooker is my best option, however I already bought a rotisserie chicken and want to use that for the meat. How long would you suggest cooking the veggies and broth in the slow cooker before adding the chicken? Thanks! I would say you would need to cook the veggies and broth about 6 hours before adding the chicken. Of course, depending on how hot your slow cooker runs you may need to increase or decrease that time. I made this tonight and it was delicious. My husband even said how good it smelled when he came in. Thanks! When do I add Beans if I want beans? Hi Angela, if they are canned beans you can add them towards the end of the cooking time. I’m wondering if the coconut cream has a strong flavor in the chili? I very much dislike anything coconut flavored so I’m wondering if it would ruin it for me. I’m not opposed to just subbing heavy cream but am trying to limit my dairy. Hi Amanda, it will have a little bit of a coconut flavor. You might be best to go with heavy cream. Favorite meal I have eaten on Whole 30 to date! So badly just want to add bit of jasmine rice to it! Love the asian/curry feel to it. Very satisfying! Can you leave out or substitute the coconut milk? Yes, you can leave out the coconut milk. If you don’t need the dish to be Whole30 you can substitute heavy cream or half & half as well. This is delicious. I added some white sweet potatoes and parsnips for more veggies and it turned out great! Love the addition of the sweet potato and parsnips! Yum! If you’re short on time can you put the slow cooker on high for 4-5 hours? Yes, you can use the HIGH setting though you likely won’t need to cook it a full 5 hours. My husband and I love it! This is the second time I make it at his request. It was absolutely amazing! Good taste and flavour. I added rice for my husband as well as I topped it up with cheese and avocado. We love this recipe!!! It is a staple in our house. I’m doubling the recipe for guests to join tomorrow and only have one can of coconut milk. I was thinking I could use regular milk for the second can, but what are your thoughts on adding Greek Yogurt? And how much would you add? I’m afraid to try this without asking for input because I don’t want it to be a fail for when our guests come! You could certainly add Greek Yogurt. I would think 1 cup would be a good amount. Let us know how it turns out with the yogurt. One of our favorite recipes! What are your thoughts about using Greek Yogurt instead of coconut milk for creaminess? I know it won’t be whole30 then. Great question! Because this soup uses chili powder, cumin and oregano it has a more of a Mexican flavor than Thai (which is typically coconut, lime, lemongrass, fish sauce and something sweet like sugar). Does it work to add chicken thighs while cooking in the crockpot or will it get too watery? Chicken thighs will definitely work in this recipe. This recipe is fabulous and a go to for my family! Would it be okay to share on my facebook group? I’m a hairstylist/makeup artist and I share recipes every Tuesday! Until now, I’ve only shared mine, but this one needs shared and shared! I’d post with the link to this original post of course giving you all credit! But I did want to double check to make sure it’s okay! Thank you for your kind words. Yes, you may share the recipe with credit and a link to the post. Thanks for asking! My husband went back for thirds and he says he “hates soups” haha I will definitely be making this again! Hahahahahaha! You sure showed him! I am new to the dairy free life and I did not like this at all. It had zero flavor and I followed the recipe exactly. Thanks for your feedback. We’re sorry you didn’t find this recipe to be pleasing to you. It’s definitely not the same as it is when made with dairy. Hi- I’m new to using the instant pot and this seemed like a good recipe to try . It’s cold here in NE today and I had chicken and jalapeños that I wanted to cook with. I didn’t have a green bell pepper but I had two jalapeños that I diced up. I used two onions and four large chicken breasts so I doubled the seasonings as well. I only put 6 cups of chicken broth in but added one can of Rotel. I also only had one can of lite coconut milk so I added some 1/2 & half to add creaminess. I must say that even with all of my omissions, this was delicious! Looking forward to making it when I actually have the right ingredients on hand. I’m sure it will be fantastic. Thank you. I’ll look for more of your recipes. Way to get creative with what you have on hand – it sounds delicious. What can I sub for the coconut milk? Heavy cream or half and half would work too if you tolerate dairy. Hope you enjoy! Can we substitute the coconut milk for cream or something else ? Yes absolutely! You could sub half and half or heavy cream. Made this last night for a group of 11 people and everyone loved it. But down in south Texas we call this taco soup. Served up with avocado and tortilla chips (for the non-whole30ers). I added diced tomatoes and chopped zucchini and yellow squash to make it a little more hearty. Why do you use full fat coconut milk? Not fan of light? We use full-fat coconut milk because it gives you a richer end product. It’s also more economical in that ‘light’ coconut milk is simply full-fat coconut milk that has been watered down – so you’re paying for water. If you prefer the texture, etc. of light coconut milk we recommend adding your own water at home to save a few bucks. Hope that helps! So… does this take 6 hours or 7-8? Depending on how hot your slow cooker runs and how thick your chicken breasts are this could take anywhere from 6 to 8 hours. I’ve updated the cook time in the recipe for the sake of clarity but it’s best to base the timing on your equipment and these are just rough guidelines. Thanks for asking and bringing that discrepancy to our attention. This is an amazing chili! The coconut milk and lime made such an amazing flavor combo. I’m not whole 30 so I added pinto beans and served it with crushed tortilla chips and avocado. Perfect crock pot dinner for when it’s 105° outside and I don’t want to use the oven. You’re so right! Perfect for those hot summer days when the oven is the last thing you want heating up the house! Glad you enjoyed this recipe! This is delicious. My super picky husband even likes it!! I’ll be making it again and again. It took me about 35 mins from start to finish which was also awesome!! Thank you! Hi Ashlee – this is great news! Glad you loved it and that it was so quick to make. What can I replace the coconut milk with? If you’re not opposed to using dairy, heavy cream or half and half work great in this recipe. If you can’t do dairy, you can just leave the coconut milk out and replace it an equal amount of water or broth. Just reading the ingredients, it reminds me of a chicken tortilla soup, which is fine, and right up my alley. This chili really sounds and looks delicious and I look forward to making it! If I remember to, I’ll leave another review with a rating! My favorite chili is a vegan, red lentil chili. It’s truly phenomenal. This is one of our favorite recipes!!! So delicious!! Awesome! Glad you loved it! 40 Dollars for a can of coconut milk??????????????????????????????????? That is the price for a case of coconut milk (12 cans). Hi Jessica! I love and appreciate all your recipes and I can’t wait to try this one! I wanted to know your thoughts on using vegan cream cheese instead of Coconut milk…do you think that would work? Thank you – that’s so kind of you! I think you might be able to use something like Kite Hill Cream ‘Cheese’ since it’s very smooth. I’d test it by adding a spoonful to a bowl rather than adding it the entire batch. It MAY curdle with the lime juice – but I can’t say for sure. NutPods (original flavor) also works in this recipe – though it contains coconut which you may be trying to avoid. This is the best soup I have ever made. I pretty much drank the broth from the bowl! I did the stove top version in my dutch oven. I used an organic chicken broth per the recipe but started with 2 cups versus 3 and just added more as I saw fit. I found full fat coconut milk in a can at my local Target. I doubled the lime juice. The chicken needed more than 10 to 12 mins for me b/c they were thick chicken breast. I just kept an eye on them and shredded them as they cooked through. For extra heat I added a can of green chilies and sprinkled cayenne until I was happy! AWESOME!!! So glad to hear you loved this recipe! This chili is so delicious! Thank you for the recipe. I am wondering if I could freeze this? Yes, you can certainly freeze this. I added sriracha for a little kick! Awesome! Thanks for your feedback. Glad you love this recipe! And white beans make for the perfect addition..I add them in too when I want to make the Chili a bit more hearty! How do you keep the chicken breast moist? I even pulled the chicken out and didn’t contribute cooking in the soup and the chicken although shredding was tough. Delicious broth. I haven’t had an issue with the breast becoming overly dry as you describe, I’m sorry to hear yours wasn’t as moist as you’d have liked. You can substitute chicken thighs for the breasts or use a combination of breasts and thighs and remove them from the broth a little earlier – your slow cooker may run hotter and thus cook faster. Thank you. I was reading about this and I might have had my chicken in the broth too hot and therefore it tightened up. You’re welcome! Keep in mind too, that some chicken breasts are treated with a saline solution to help keep them moist so if yours wasn’t (like mine aren’t) then they will cook faster – or at least get tougher faster. I used boneless skinless chicken thighs for moister chicken. I made this for dinner tonight using the IP instructions. I only used one cup of bone broth and I added 1 tsp of ground coriander to the spices and reduced the cumin slightly for my taste. I would not really call this chili, it was more of a soup (I did cook on saute for a while to see if it would thicken up but we were too hungry to wait much longer). It was really great though and will go into my recipe binder to make again! Glad you like this recipe! Thanks for sharing your feedback! This was a great recipe! I made a few minor substitutions with adding two jalapeños with the seeds (we like our chili spicy!) and I did add in ghee to the instant pot. It adds a nice depth of flavor. Thanks, Mason! Good to know that you found the ghee to be a helpful addition when made in the Instant Pot. This looks great! I’m interested in adding in some beans however, since I don’t necessarily need it to be whole30, at what stage would you recommend adding them? Simply canned beans, maybe kidney, black or white beans? Thanks, Tara! I would add the beans when there is one hour of cooking time left. This will keep them from getting too mushy. I never leave comments on things like this BUT I made this the other night and absolutely loved it! My husband said it’s the best thing I’ve ever made! I added a lot of cilantro and we actually broke up some corn tortilla chips in it like crackers. So delicious! Thanks, Jessica, for taking the time to comment – I’m so happy to hear you both loved this recipe! oh my gosh…this is AMAZING! My new favorite soup! Yayyyyy!!! So glad you loved it! 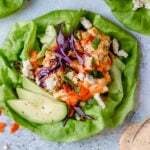 Do you think you could use ground chicken/turkey with this recipe? If so, just brown meat first? Yes, you could substitute ground turkey or chicken for the chicken breasts in this recipe – like you said, just brown the meat before adding it to the slow cooker. My family is not coconut fans any substitutions suggestions for the cocunt milk? If you’re okay with dairy you could substitute half and half. Hey there 😊 I am wondering about making this for my lunch company of 16 people. I am wondering if i should triple this recipe or more? I have two large crock pots I can use. There is one person coming that is lactose intolerant and is also on a gluten free diet. I wanted to make something that everyone would enjoy and she wouldn’t feel left out😉 Your recipe sounds awesome. Do most people enjoy this too even if they aren’t on a special diet? She isn’t able to have bell peppers. Will it be odd without it? Thank you! How sweet of you to make a dish that all of your guests can enjoy. First off, I would triple the recipe just to be sure you have enough (you may get lucky and have some leftovers, too). I would just divide the triple batch between the two slow cookers. Secondly, everyone we know who’s tried this – special diet or not – has enjoyed it immensely. I often make it for gatherings and never tell anyone that it’s Whole30-friendly etc (unless, of course, they ask). Lastly, you could replace the bell peppers with some extra onions for flavor or add additional diced tomatoes (drained) to make up for the bell peppers. WOW WOW WOW! Easy and delicious recipe. Added a bit more spice as my family does like spicy food. A definite redo in my house. Thank you!!! Awesome! Glad you loved this recipe! I really enjoyed this recipe- and my husband did too! I used chicken tenderloins- so mine cooked in about 5 hours. I also added a sweet potato, a can of rotel, and served over cauliflower rice. So satisfying. I’m so surprised I enjoyed this! 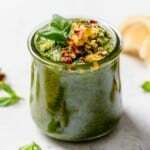 This recipe has been on my radar for months because I was doing a nutrition challenge with my CrossFit gym and everybody was raving about it. I don’t normally like chili, so I’m not sure why I decided to finally try it, but I’m so glad I did because this is subtle yet hearty and nourishing! I made the stovetop version with added white beans. It’s such a nice winter lunch! Thank you! I’m so glad you took a chance on this recipe. I also love adding beans to the chili to add some fiber, carbs, and protein and help stretch out the servings a bit. Can I use rotisserie chicken? If so, does this affect the cooking time? Yes, you can use rotisserie chicken. It likely will not affect the cooking time much as the vegetables still need time to cook and the flavors to develop. Just add the chicken toward the end of the cooking time to prevent it from becoming overcooked. O. M. G. – this chili is amazing! I used my instant pot and followed that recipe almost to a “t.” I tripled it and used a combination of olive oil and coconut oil to saute the veggies. I also useda total of 7-1/2 cups of low sodium chicken broth (which made it more like soup than chili). After the slow release, and after adding the remaining ingredients, I added 3 cans of beans – 2 cans of great northern white, and 1 can cannellini. Because I made this for a party not at my house, I transferred everything to my 6-quart crockpot and cooked the chili on low for another hour or so. The flavors melded so perfectly! This was a big hit. Thanks so much for sharing! Absolutely! Happy to hear you enjoyed this recipe! Hi! I’m not sure this has been asked but what size slow cooker do you usually use when you make this? I’m a college student so I have a small 3.5 qt one I think since I don’t have much room. Can’t wait to make this! I have a 6-qt. slow cooker but this can easily be made in a smaller one. Enjoy! This was terrific! Even my 6 yr old said it was “world famous”. I sauteed some cauliflower rice, lime, cumin, S&P and then it served the soup on top of that to add a few extra carbs. Thanks so much! I. Love. This. Your 6-year-old is a lucky kiddo and has fabulous taste! This recipe is DELICIOUS! I added 2T tomato paste for a little more vibrant color when I added the coconut milk. Served with cilantro garnish and Trader Joe’s Salsa Authentica on top for a little heat. Will recommend to friends and absolutely make again! We love hearing this – thanks so much for recommending it to your friends! It’s a yummy soup for sure…just not what I expect when I think of White Chicken Chili. I probably added too much broth because I ended up with lots of liquid (I added fresh spinach to try to make up for all the extra!) 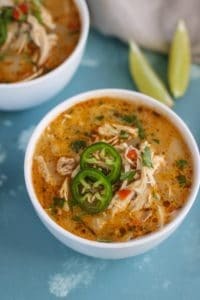 and I get using coconut milk with it being a Whole30 recipe, but to me it tastes more like a Thai Chicken soup than chili. Again, tasty!…but the title was misleading. 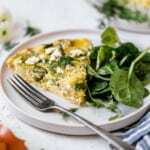 Happy to hear you thoughts this recipe tasty! Sorry for the misleading title. This the best chili ever! Don’t think I’ll ever go back to the traditional stuff. Yayyyyy!!! We love hearing this. I used a whole can of Costco canned chicken, shredded – delicious – on stovetop. Fast, easy, too!! This ain’t chili. It’s soup. Thank you for taking the time to express your opinion. Made this today but accidentally put the coconut milk in with everything else, not the end. Now it’s more like a soup. Any fix suggestion? Sorry to hear that. You’ll have tasty soup instead! Hi! I know the title advertises “bean free,” but if I’m craving beans in my chili, what kind do you think would compliment the recipe best? White beans would work great! Such as great northern beans or cannellini. Hi. Just to clarify, does this recipe need 2 cups of chicken broth or 4? The ingredients list says 2 cups, but in the the instructions, it looks like you add 2 cups, then 2 more. Just want to make sure I get it right. Thanks! Sorry about that! Recipe has been updated. Hello! I love this recipe and make it all the time on the stove top. I do add white beans. How/when would you recommend adding the white beans to the Instant Pot version so they are cooked but not totally mushy? Thank you! If you are using canned white beans you’d add them after the initial cooking time and you’ve released the pressure and removed the lid. Then select the ‘Saute’ function and bring the chili to a simmer to warm the beans through before adding the coconut milk and lime juice. SO STINKIN GOOD! Honestly best chili I’ve had. Thanks for the recipe!! Flavor was awesome! It was more soupy than thick like chili! Agree, it’s on the thinner side but I’ve had plenty of chilis ranging from thick to thin – and you can make it thicker by using less broth if you’d like. Hi, planning to make this dish in the IP. In the past, when using chicken breast the texture is dry. Have you made this using chicken thighs or a bone in meat? If so, does your cook time change in the IP. thanks! You could certainly use chicken thighs or bone-in chicken. The cooking time would be the same. Enjoy! This sounds super yummy. Do you think it would taste good with potatoes in it? Absolutely! I like to add white sweet potatoes because they’re kind of sweet and creamy and compliment the spices well (but regular white potatoes will also work). Wonderful recipe. Made a slight change… used light coconut milk instead of full fat. And added pinto beans. Followed the IP instructions and it came out so good. My husband said he could eat it every day forever and to never change a thing when I make it again. Will be making this again soon. This is amazing and the ultimate compliment! Thanks so much for sharing. I was so excited to make this but ended up disappointed… the chicken was way too coconut-y flavored. It tasted like dessert chicken- not chili! SUBLIME!!! It was love at first bite for my whole family and me. My husband said this is his second favorite soup of all time (behind the concoction I came up with in college that is on regular rotation around here). And can I just add, I did not go in looking for a low calorie, grain-free, dairy-free, Paleo, Keto, etc recipe. It is a solid recipe no matter what diet you may or may not be on. Your recipe looks delicious! Do you have the directions for preparing in an instant pot? If you scroll down to the bottom of the recipe you’ll see the Instant Pot directions. Hi. Could I substitute chicken stock for the chicken broth? As with all leftovers we recommend that you use them within 4 days and freeze them if you need to keep them longer (for food safety reasons). Love this chili! Not a fan of beans! Awesome, that’s great to hear! Hi! Can I add kidney beans? Hello! You can simply add a can of rinsed drained kidney beans along with the rest of the ingredients. Enjoy! Hi! Thank you for this recipe. It was delicious. I doubled the recipe and only used one jalapeño. I also used cayenne instead of chili powder. It was quite spicy, so added two addt’l cups of chicken broth. With all that…it still turned out delicious. My husband even said it was one of his favorite soups ever. I agree. It was perfect. I added cauliflower rice to the bottom of the bowl before serving the soup. Perfect dinner on a chilly night. Thanks again! Hi Susana! You are so welcome and thank you so much for sharing your feedback! This chili is delicious!!! The flavor is outstanding! I’ve been making more instant pot recipes lately, but decided to go ahead with the slow cooker version of this recipe. I’m so glad I did! The chicken was so tender after cooking low and slow in the broth with the veggies. This one will definitely be in my regular rotation! Fantastic! So glad you loved it! Yassssss!! Congrats- this is so great to hear. So yummy and sooo easy!!! !